Seventy-two-year-old George Walker Bush — the 43rd President of the United States — posted an Instagram photo on Wednesday celebrating his very first ace. Even more impressive? He accomplished the feat at Trinity Forest Golf Club in Dallas, Texas, home of the PGA Tour’s AT&T Byron Nelson. According to Trinity Forest’s member scorecard, there are four sets of tees to choose from at the club: Plates, Blue, White, and Red. The yardages on the par-3 12th are marked as 250, 205, 164 and 138, respectively. George H.W. 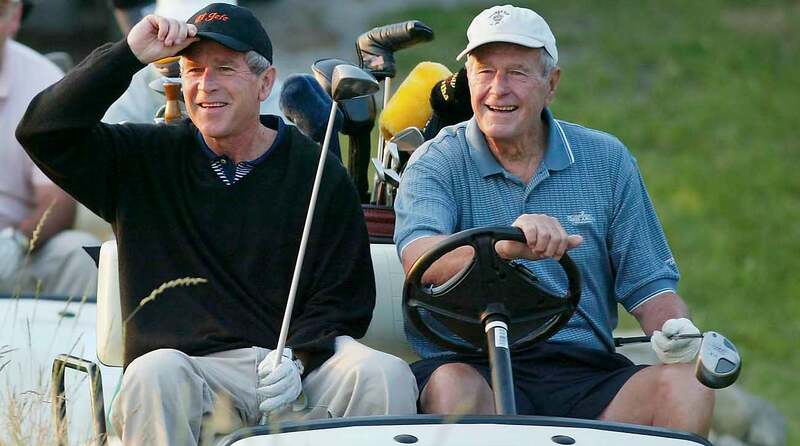 Bush (right) and George W. Bush (left), pictured here in 2002, have always shared a love for the game of golf. Regardless of the tees President Bush opted to play on Wednesday, that’s a darn good ace from any of those distances. If he keeps up that kind of accuracy, he’ll likely be shooting his age long before his 100th birthday.